The apartment is located on the ground floor and is ideal for vacation for two. From generous bedrooms, the path leads directly into the garden, as well from the living room and from the dining area out. The living-dining-kitchen area is kept open (kitchen with oven and dishwasher). The bathroom has a spacious shower. In the bright, beautifully decorated rooms with a south and a west-facing terrace every holiday is a feel-good day. DSL / WLAN access and TV are available. Your car can be parked on the property. Berlin vacation on the water: On the listed Old Town Island await Werder two high-quality apartments with Havelblick. The house was completed in 2011; Both apartments are decorated in Scandinavian country style. The ground floor apartment is ideal for couples for holidays, the duplex apartment on the first OG and DG offers optimum space for 2 adults and 2 children (additional bed). Enjoy your holiday between lakes, Potsdam, with its Prussian palaces and the shopping and cultural offerings of Berlin! Beaches: Above all, the beach Caputh is recommended. It is easily accessible by bike. Italian cuisine and a Caribbean beach on a water pavilion invite you to enjoy and relax. Other swimming areas are available. To a large Wannsee are by car just 30 minutes. Riding: In the countryside, especially in nearby Phöben there are numerous horse farms. Riding courses for experts and beginners offered. Bathroom with window. Extra large shower. The very tasteful decor in Scandinavian country style invites you to relax and unwind. Here, guests will feel at home. The kitchen is fully equipped (dishwasher, stove with oven, fridge). From the kitchen window you can enjoy a beautiful view of the windmill. The tasteful bathroom with window has an extra large shower. For towels and linens will be provided. TV, radio and a fast DSL Internet connection are also available. Practically, the parking in the grounds. Die Ferienwohnung ist sehr schön und entspricht in der Wirklichkeit auch den Beschreibungen in den jeweiligen Portalen . Die Lage ist sehr schön und absolut ruhig. In der Wohnung ist alles vorhanden. Wir haben nichts vermisst. Die Übergabe hat problemlos funktioniert. Die historische Altstadt Werder ist ebenfalls sehenswert. Alle Einkaufsmöglichkeiten sind vorhanden. Sehr gut ist auch die Gastronomie. Das Essen in der Bürgerstuben kann jederzeit empfohlen werden. Das Fischrestaurant Arielle liegt direkt am Wasser und das Fischsortiment lässt keine Wünsche offen. Von Werder aus können sehr schöne Tagesausflüge unternommen werden. Mit dem Regionalexpress erreicht man Berlin in 35 Minuten. Wir selbst waren sehr viel mit dem Fahrrad unterwegs (Potsdam, Brandenburg und auch Berlin). Wir werden mit Sicherheit wieder einen Urlaub in Werder und in der Ferienwohnung "Am Müllberg 18" verbringen. Wir hatten die Ferienwohnung anlässlich eines Familientreffens am 2. Weihnachtstag in Berlin einige Tage benutzt und waren sehr! zufrieden. Es war alles da und die Umgebung und der Ort Werder hat begeistert. Potsdam ist gleich in der Nähe und Berlin ebenfalls gut erreichbar. Wir kommen gerne wieder. Wir haben im Juli zwei Wochen in dieser absolut empfehlenswerten Ferienwohnung verbracht. Für uns war die Wohnung perfekt. Besonders gut haben uns die beiden Terrassen gefallen, die wir natürlich ausgiebig genutzt haben. Es kann auch nichts mehr von oben durchrieseln, da alles abgedichtet wurde. Der Ausspruch meines Mannes " Diese Wohnung würde ich überall hin mitnehmen" bringt es auf den Punkt. Wir hatten eine super schöne Woche! Die Wohnung ist perfekt ausgestattet und sehr liebevoll eingerichtet. Wir kommen gerne wieder! Man fühlt sich sofort heimisch. Alles da (naja, evtl. ein Besen wäre schön gewesen; wir waren mit Hund da...), liebevoll dekoriert und zusammengestellt. Alles in wenigen Minuten zu Fuß zu erreichen. Wir haben uns sehr wohl gefühlt und bei schönen Spaziergängen hervorragend erholt. Berlin vacation on the water: On the listed Old Town Island await Werder two high-quality apartments only 50m from the water. 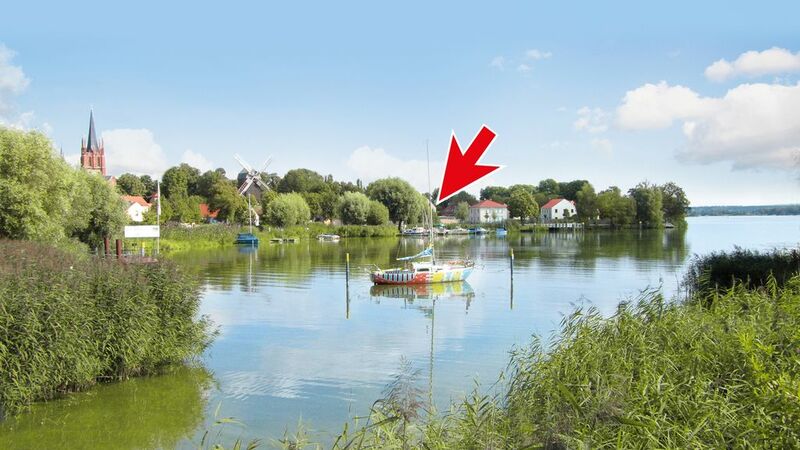 The place is located 12 kilometers southwest Werder of Potsdam and 23 kilometers from the outskirts of Berlin. From Werder station (a five minute drive, parking for free) you can take the local train in just 30 minutes to the heart of the capital. The castles of Potsdam can be reached by car within 15 minutes. The flat landscape Havel invites you to a bike ride one outright: Follow the winding river through oak and pine forests. Join us at one of the cozy beer gardens on the water or do you break one of the many beaches. Hikers and walkers enjoy the paths along the lakes. And of course, water sports enthusiasts get their money's worth: Just 150 meters from your apartment you can rent pedal boats and motor boats; also for paddling, surfing and swimming itself offers many opportunities. Golf: In about 6 kilometers away, you find the Golfclub Märkischer Potsdam. An 27-hole course provides a sporting and social framework for advanced and beginners. A place to relax and feel good.